This grilled rack of lamb is a four-in-one recipe. First it’s covered in a smoked paprika rub. Once the rack is grilled to your liking, serve it with your choice of an Asian-inspired sauce, harissa yogurt, or honey mustard sauce. 1. Set up your grill for medium to medium-high indirect cooking according to the instruction manual. 2. In a small bowl, stir together the sugar, paprika, salt, and pepper. 3. In a small bowl, whisk together the vinegar, soy sauce, and sesame oil. 4. In a small bowl, whisk the yogurt, harissa, and garlic together. Season with salt and pepper, and taste, adding more harissa if desired. 5. In a small bowl, whisk the oil and vinegar together, then stir in the mustard, honey, and garlic until well combined. 6. If you’re using the smoked paprika rub, sprinkle the rub all over the lamb racks, patting gently to help it stick. If you’re not using the smoked paprika rub, pat the lamb racks dry with paper towels and sprinkle with salt and pepper on all sides. 7. 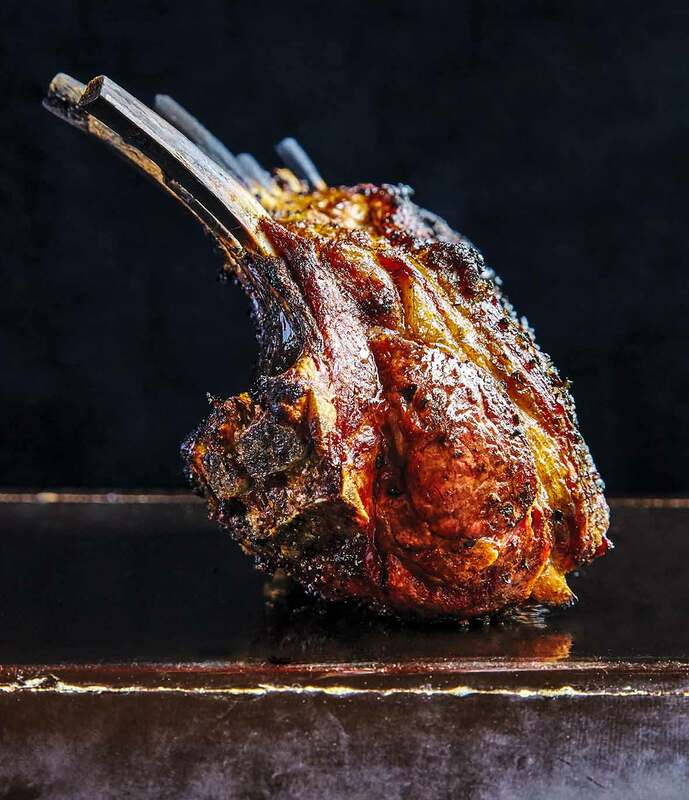 When the grill is between 400° and 500°F (200° and 260°C), place the lamb directly over the fire, placing the thick ends of the racks over the hottest part. Close the lid and cook, turning once, until well browned, 4 to 5 minutes per side. 8. Move the racks to the indirect side of the grill, with the thick ends positioned closest to the fire. Close the lid and cook until the lamb is 5° to 10°F shy of the desired doneness, 10 to 30 minutes total, depending on the size of the racks, how you like them done, and how hot the fire is. 9. Transfer the ribs to a cutting board and let rest for 5 to 10 minutes. Cut in between the ribs to create lamb chops, pile them onto a platter, and serve with your desired dipping sauce. I made this grilled rack of lamb using the smoked paprika rub instead of one of the dipping sauces. The aroma of the rub, the scent of the rack of lamb cooking, as well as the appearance of the finished chops—it was all intoxicating. The taste lived up to the expectations. Such a simple recipe allows the meat to shine. This is something to keep in your back pocket, to have a luxurious-seeming dish without really any planning or effort. We all very much enjoyed this grilled rack of lamb. It's a simple, easy recipe to put together that is perfect for grilling season. I made the 3 dips for everyone to try. Each of the dips was finished before grilling the racks, allowing the flavors in the dips time to blend. We cooked the racks over the center grill set on high for 8 minutes and then moved them to each side of the grill off the heat to finish cooking for another 14 minutes. Since it was spring lamb, the racks were on the thinner side, so cooking them only took a total of 22 minutes. And then we had to wait while they rested...that was probably the longest 5 minutes I've had in a while. More meaty racks might take longer to cook. Ours were a beautiful blush pink and juicy inside. So, after much debate, the favorite dip was the Honey Mustard, followed very closely by the Harissa Yogurt and then the Asian Dipping Sauce. That said, there was not a dip on the table that anyone disliked. As we were fishing our meal, everyone starting coming up with other items the various dips would be good with, including steak, duck, sausage, chicken, pork, and the list goes on. This was a most enjoyable meal that we will be very happy to repeat over and over as long as we can grill. We got 6 servings in total. There were 2 ribs left for lunch and they were just as good the next day. Such a simple and gratifying reward for just a little effort. As a Greek girl, I’ve certainly enjoyed my share of BBQ'd and grilled rack of lamb in my life, but never have had it so simple and with such an unusual pairing as the soy and sesame dipping sauce. This combination beats that celebrity chef version in my book. We did 1 rack for 2 people, although at just under 2 pounds, we could have saved 2 of the 8 ribs for another day if they were not so lip-smackingly good. The important thing to really pay attention to is being fairly aggressive with trimming the lamb of any excess fat, because it really does want to flame up. I had himself as my grill-engineer, and we decided on a target temperature of 135℉ as our cue to remove the lamb from the grill. Any flareups, we just moved the lamb off the fire for a few seconds then back on. The warm up on our 3 burner gas grill was Hi-Hi-Hi, then while grilling, Hi-OFF-OFF, and when the meat moved to indirect, Lo-OFF-OFF. Temp falling to 375/350℉ during the indirect time, turned back up to HI-OFF-OFF. Better to have left it at Hi-OFF-OFF entire indirect time. At 19 minutes, we read 135℉ and removed the lamb to rest for 5 minutes, tented with foil. The temp rose to 151 to 153℉. Doneness was medium/medium-rare. Another time we would trim fat even more aggressively than we did (there was no chine bone to remove on the Australian rack of lamb we cooked). We also would probably stop at 130℉ to end up with a slightly more pink result. The ribs were wonderful with the simple sauce to dip in. If your racks are especially meaty, think 3 ribs per person would be a nice serving, with smaller spring lamb, maybe 4. 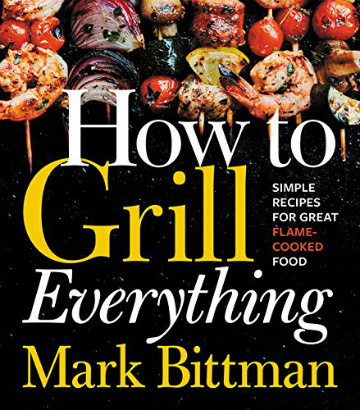 Grilled Rack of Lamb Recipe © 2018 Mark Bittman. Photo © 2018 Christina Holmes. All rights reserved. All recipes and photos used with permission of the publisher.